Cool young babes with baubles on the arms of rich old dudes set the tone at the fund-raiser for the Uptown Women's Center in downtown Dallas of which the Edna Gladney Adoption Services--home of thousands of unhappy relinquishments--will be a part, according to The Dallas-Fort Worth Evening News. Sarah Palin was a keynote speaker at the main event last Friday evening (April 30, 2010). Well, not really. I mean, not really was that the story in the local press after the protest against the Sarah Palin speech at the godawful Gladney gala at the Fairmont Hotel in Dallas the other night, according to our intrepid reporter and all-around hell raiser, Linda Burns, who organized the protest. "There were many very old, old, ancient old, looking men, with their very, very young--maybe teenage or not much older--wives, said Burns. "They looked like little girls dressed in their make believe make-up and evening wear." (Note: Probably they were older than they looked, just the recipient of some expensive face-lifting. Probably older than they looked and that is why they needed to adopt someone else's baby.) According to Palin's own website (palin4life), parties of four who wished to meet and greet Palin and have VIP seating for the dinner pitched in $25,000 for the privilege. Karen Belanger Brown and Elise where drivers were dropping off guests. Other guests, Burns said, were older women, who became enraged when they read the signs. "They had so much make-up, so much jewelry, and such stiff looking hair, that when they got mad, it was a sight," she observed. "I live on a farm and have a rooster named Rudy. Some of these women would do their necks like he does, ruffle their feathers, and eyes pointed down the long beaks." 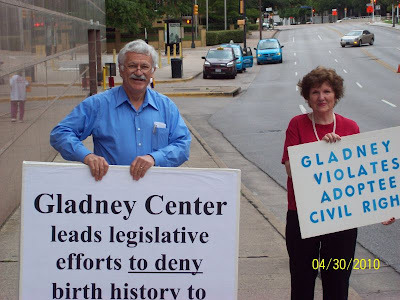 Gladney is been one of the main supporters of keeping adoption records sealed and preventing adoptees from having their original birth certificates and identities; Gladney is a founding member of the numero uno enemy of adoptee rights, The National Council for Adoption, otherwise known as NCFA (pronounced Nick-FA). "We believe the only reason birth records are closed to Texas adoptees is due to the wishes and whims of the Edna Gladney agency," said Burns, who reported for Birth Mother, First Mother Forum. Gladney maintaining an outreach office in the Dallas Uptown Women's Center is clearly an outreach to convince more women to give up their babies to fill orders for their waiting customers, prospective adoptive parents. According to Burns, many of those attending the gala were quite bothered by the protesters. "They did not like us," Burns noted in her usual understated way. 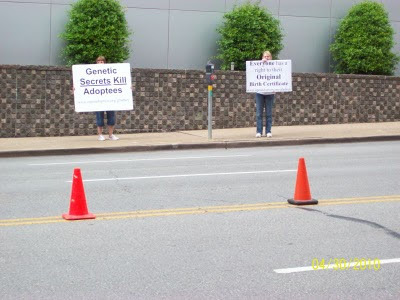 Many who came to hear Palin were guests of the hotel and came outside to gawk--amazed--at the protesters, who carried signs that said: "Genetic Secrecy Kills Adoptees." One man approached Burns and told her that he had adopted a daughter from Gladney 35 years ago, and he was rather put out by her sign. Burns showed him the scar on her left temple and forehead and told him that people in her family had died from brain aneurysms, but as long as the records were sealed, people like here would not be able to pass this information on to the next generation. "Medical histories constantly change," Burns said. "Would Gladney keep him informed? When was the last time Gladney told him there was a medical situation the daughter needed to be made aware of? Medical conditions like brain aneurysms kill--this is one of many reasons that adoptees should have open records." Another protester, Elise Perkins had a sign that read, "Gladney Get Out, From a 1973 Gladney Survivor". She and others sometimes chanted, "Gladney Get Out!" Bill Betzen (pictured here with Burns) spoke to many people and offered a hand of friendship and help to any needing to understand adoption. Not all the guests appeared to be upset with the protest; some smiled at the rabble-rousers as they went in. "I believe there are some that Gladney supporters that just don't have a clear understanding of what the facts are, Burns commented . 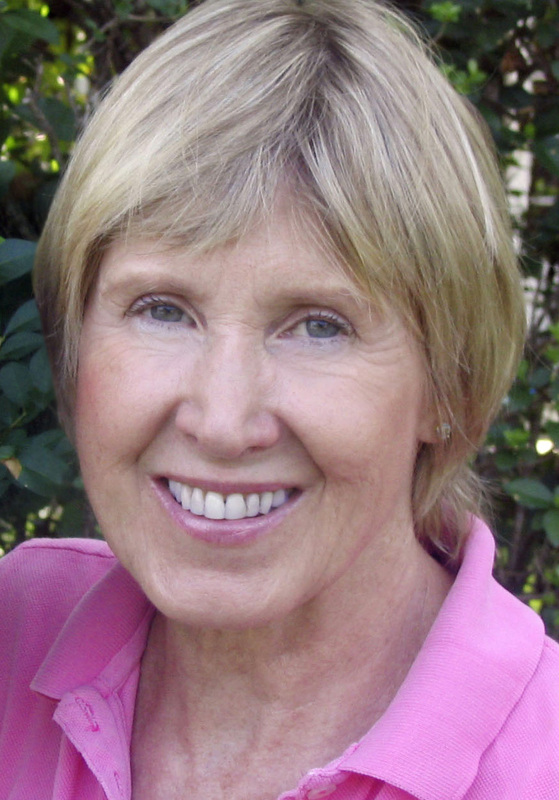 "I believe these people would not be supporting Gladney if they knew the facts." As an aside, Palin's teenage daughter did not offer her baby to adopters, but chose instead to raise her, and for that we applaud Bristol Palin. To those who wonder if Palin's politics were a reason for the protest, Burns wants to make it clear that she is a registered Republican, and a Tea-Bagger, but anti-Gladney. "Just having a grandson born outside marriage does not make her an expert on adoption," Burns remarked. The Dallas Police at the scene told Burns and company that they were were the best (Ed, I.E., well behaved) protestors they had ever seen, and several of them agreed with them. "They didn't appear to be is such awe of Gladney as the Fort Worth Police, added Burns, obviously speaking from prior experience which she did not elaborate. PS: We hope that if any women reading this who feel they MUST relinquish their child for adoption will not use the Gladney agency, but find another that supports, really supports, open adoption and our advice would be to hire a lawyer on your own and draft a contract that the adoptive parents sign in the presence of a notary. As well as your own lawyer. Adoptees who come through the Gladney process and want to find the truth of their origins later in life are generally screwed. Do something better for your child, no matter how cushy the comforts of the agency home. You can say no. You can. Say. No. Thank you for the informative post, Lorraine. Resultant from monitoring the various goings on of former half-term Governor, Sarah Palin, the blog Palingates has become interested in the questionable activities of Gladney. I was at Friday's event for said purpose and while time didn't permit me to speak to the protesters, I was heartened to see then there. Furthermore, your post was an entirely accurate account of what I saw and heard. In order to flush out our reporting, I'd appreciate additional information on the Gladney Center; at your leisure, please contact me at trigmundfreud@gmail. Cheers. Linda Burns is my hero. She and her wonderful husband, Tommy, are absolutely the most entirely decent human beings I have ever had the pleasure of meeting, and they give me faith that human beings CAN be kind to one another. Re The Dallas March---Karen said that the reporter that filmed and interviewed her said he was there for Channel 4, 5, 11 and 33, but she thinks the van he got into and drove away said Channel 5. Thanks so much to these brave souls who are making a difference. I am so glad (excuse the pun) this was done because it needed so to be done. All of us need to protest more and aggravate them constantly until the tide begins to change. They have pushed us onto the sidelines and into the background and I think the power of presence in person needs to be a common occurance as perhaps the internet is not enough. (Pickiting outside of Daniel O'Donnell's office is a needed venture...I'd love to see a crowd support us and trash him LoL). I second what Peach said, thank you very much Linda and all others who were with her! If ever an institution has earned our protests, it's Gladny. Kudos to Linda, Tommy and all that were there. I would have loved to have seen the matrons bristle. That would have made my day. I was fortunate to have been included in the calls for people to join in this protest of Gladney. Linda, Tommy, Elise, and Karen were all wonderful to be with! Together the issues of adoption in Texas, and the unethical activity of Gladney, were well exposed. These facts must continue to be better known by more people, especially our legislators. We are heading in the right direction. Please take every opportunity you have to speak with any Texas legislator you see about the abusive nature of Texas adoption laws. Thank you to Linda and Tommy for driving from Austin and doing the work needed to pull this together.